Superman Fan Podcast Episode #312 Part II: Superman Family Comic Book Cover Dated October 1960: Superman’s pal Jimmy Olsen #48! Superman’s Pal Jimmy Olsen Jimmy Olsen #48! 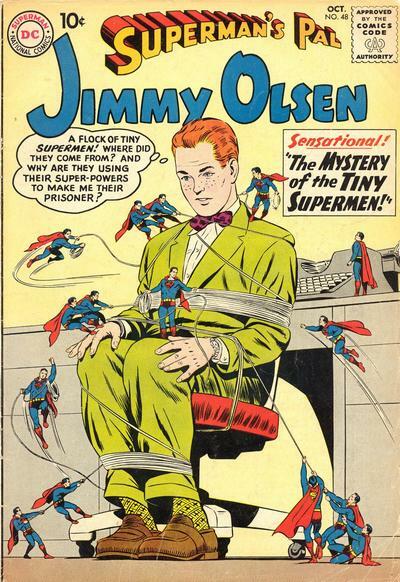 SUPERMAN’S PAL JIMMY OLSEN 48, October 1960, was published around August 16, 1960. It contained 32 pages for the cover price of a dime. The editor was Mort Weisinger, and the cover was pencilled by Curt Swan and inked by Stan Kaye. It featured the issue’s third and final story. All three stories were pencilled by Curt Swan and inked by John Forte, and have been reprinted in SHOWCASE PRESENTS: SUPERMAN FAMILY vol. IV. – THE STORY OF CAMP SUPERMAN (9 pgs. ), writer unknown. – THE DISGUISES OF DANGER (8 pgs. ), writer unknown. – THE MYSTERY OF THE TINY SUPERMEN (9 pgs. ), was written by Otto Binder. This story featured the first appearance of the Superman Emergency Squad. Also highlighted in this episode are this issue’s ads and other features, including the JIMMY OLSEN PEN PALS letter column. In 2 Weeks: SUPERMAN FAMILY COMIC BOOK COVER DATED NOVEMBER 1960 PART I: WORLD’S FINEST COMICS 113! In 3 Weeks: SUPERMAN FAMILY COMIC BOOK COVER DATED NOVEMBER 1960 PART II: SUPERMAN’S GIRL FRIEND LOIS LANE 21! January 7, 2015 would have been the 125th birthday of the founder of DC Comics, Major Malcolm Wheeler Nicholson. To learn more about the Major, check this website about him, as well as this blog post about him written by Gerard Jones. He is writing a biography about the Major, along with the Major’s granddaughter, Nicky Wheeler-Nicholson. She will be attending Pulp Adventurecon on Saturday, February 21, 2015.